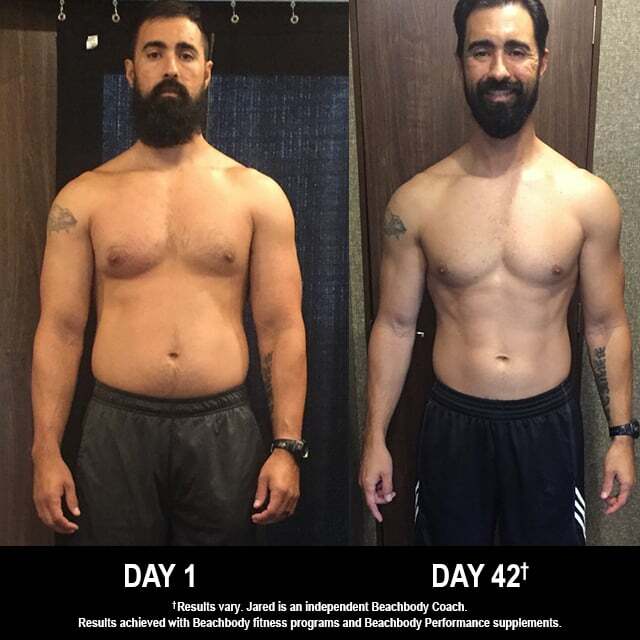 21 Day Fix EXTREME Results: Jared Lost 14 Pounds in 42 Days! Jared Chapman lost 14 lbs. in 42 days with 21 Day Fix EXTREME, Shakeology, and the Beachbody Performance supplements. He entered his results into the Beachbody Challenge, and won the $500 Daily Prize for November 20th! I had always been able to gain and lose weight pretty easy. But when I would gain weight, it was never how I wanted it to look. Nothing toned on me at all; it was all mass. I wasn’t eating that great and put on 15 pounds in just a few months. I was tired all the time and pretty much wanted to lay around, because of what I was eating and my heavy-lifting workouts had worn me down. I needed something that would give me the results I wanted. I wanted cuts and to get my mass of a body toned. It is aggravating to see that your belly sticks out further than your chest. My greatest challenge was changing my eating habits because of the last few months and how I got used to eating. The program was only 21 days, and I didn’t mind doing it back-to-back. I really enjoyed the food and the portion-control system. I liked the fact that it was only a 21-day program and came with the portion-control system. I also love that it had some weight-training exercises. The definition that I achieved with this program was amazing! I could see my abs, and I believe it came more with the portion-control system. The confidence is great! You also become a little more aware of what you put in your body and how it affects your results. It helped me stay accountable seeing all the other challengers posting their workouts and photos. There was no reason why I shouldn’t be holding myself accountable. Pushing me to stay accountable and stay on track to show others that if I can do it, then they could do it. Still, even after the programs, I drink Shakeology. It is a wonderful post-workout snack and helps with the late-night sugar cravings.2 I also love the Energize pre-workout supplement. It became a ritual every morning to drink my pre-workout supplement to get me pumped and stay pumped throughout my workout. How did a Beachbody supplement, nutritional product, or program affect any existing health conditions you have? It helped me get back energy. I was also able to detox from sugar, which I have been wanting to do for a long time.